(JTA) — Itzik Shanan and Abbas Suan watched last week as 100,000 English soccer fans sang along to a live performance by a multiracial quartet at London’s Wembley Stadium. Shanan, who started a campaign to eliminate racism from Israeli soccer, and Suan, a well-known Arab-Israeli player, were in Britain for five days of anti-hooliganism training in advance of Israel’s hosting next month of a major international soccer tournament. For Shanan, the operatic rendition of “Abide With Me,” a Christian hymn that has become something of a soccer anthem, was a reminder of the sport’s potential — and its pitfalls. The ground Shanan believes Israeli soccer needs to cover is not on the field. For the past decade, England’s Football Association, or F.A., has trained dozens of Israeli activists who hope to re-create what they view as the F.A.’s success in reducing widespread displays of racism that tarnished the image of English soccer. Shanan and Suan were part of a delegation of 10 Israeli Jews and Arabs in Britain last week for F.A. training. England is described as “a world leader in dealing with soccer racism and hooliganism” on the website of the New Israel Fund, the U.S.-based social justice group that created and bankrolls Shanan’s nonprofit, Kick Racism Out of Israeli Football. But a recent spate of anti-Semitic incidents in English soccer, and the F.A.’s refusal to fully adopt new European countermeasures, are making some question the association’s suitability to instruct others in countering racist tendencies among fans. “Clearly, Britain has not resolved its soccer racism and violence problem and is therefore no model for Israel,” said Manfred Gerstenfeld, a Dutch-born scholar of European anti-Semitism at the Jerusalem Center for Public Affairs. Critics such as Gerstenfeld point to a string of troubling incidents over the past year. Since then, Israeli midfielder Yossi Benayoun of Chelsea has been the repeated target of anti-Semitic hate speech. Police are investigating the latest incident, in which Benayoun was the target of an anti-Semitic epithet on Twitter. And in January, the Israeli-born Tal Ben Haim, who plays for the Queens Park Rangers, was subject to anti-Semitic abuse on the soccer club’s official Facebook page. Meanwhile, anti-Semitic slogans are routinely heard at soccer matches elsewhere in Europe. In Budapest, fans shouted Nazi slogans at the Israeli national team during a friendly match in August. In Italy, fans of the Lazio club also chanted anti-Semitic slogans during a match against Tottenham; some are believed to have participated in the stabbing of a Tottenham fan at a Rome bar. Incidents like these prompted the Union of European Football Associations, or UEFA, to introduce a 10-game ban on anyone caught engaging in racist abuse. In England, the F.A. last week introduced a five-game ban, drawing sharp criticism. Jason Roberts, a black British soccer player, said it exposed “bad decisions, lack of will, lack of consultation and lack of leadership” by the F.A. In December, Kick It Out Chairman Herman Ouseley criticized the F.A. for “delaying” a detailed plan to fight soccer racism. Still, the F.A. does have a proven record on curbing racism, according to Dave Rich of the Community Security Trust, British Jewry’s anti-Semitism watchdog. According to Rich, this has been achieved through a combination of F.A. action and the Kick It Out organization, which the F.A. helped establish in 1993. Focusing on preventing racism through education, Kick It Out organizes summer activities for children, workshops for soccer players and seminars for educators. It also inspired Shanan’s Kick Racism Out of Israeli Football organization, which for the past decade has used Kick It Out tools with some local adaptations. “One lesson we learned from England is to integrate Arab and Jewish children in one team instead of letting them play on opposite teams,” Shanan said. As in Britain, Israeli soccer racism continues to be a problem despite the efforts of police and activists. The signing of two Chechen Muslims by Beitar Jerusalem this year led to the torching of the team’s trophy room. Last year, Beitar fans attacked several Arabs at Jerusalem’s Malha Mall. Gerstenfeld, a Dutchman who moved to Jerusalem in 1968, acknowledges that racism exists in Israeli soccer, but is nothing compared to the violence endemic to British and Dutch soccer. 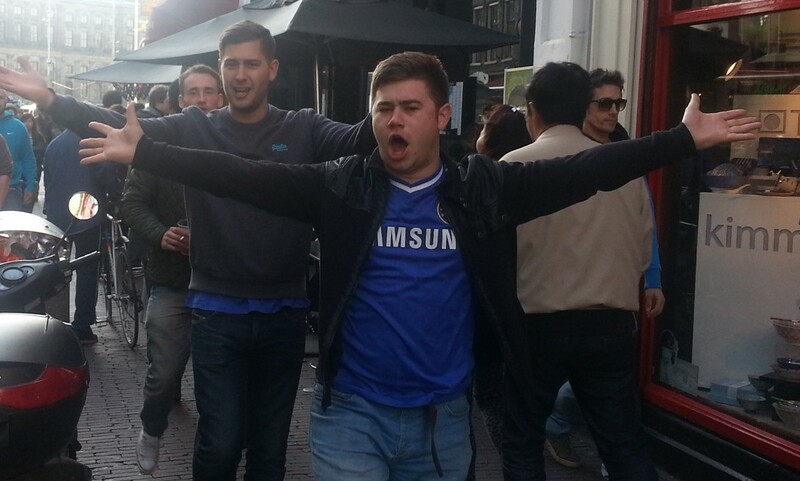 Adam Green, a Londoner and Chelsea supporter in Amsterdam last week to watch his team battle Portugal’s Benfica in the Europa League final, offered a simpler distillation of the football hooligan’s credo. Fortunately for Amsterdam, Chelsea defeated Benfica, 2-1.